The Tan Chin Tuan Mansion on Cairnhill Road, Singapore, built in the early 1930s is described as an outstanding conservation effort and engineering marvel. 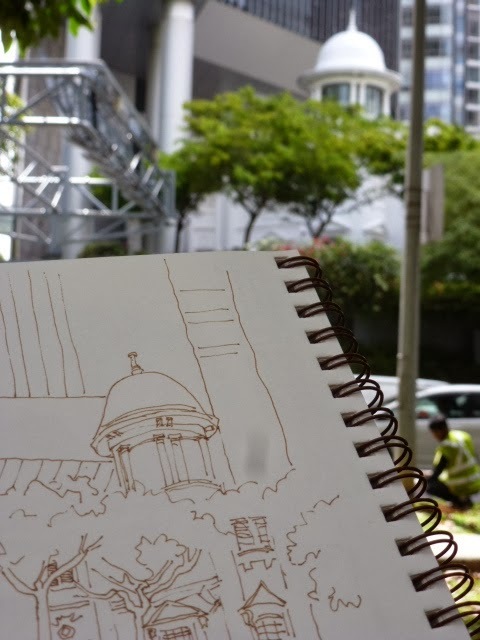 Trees obliterate much of the view of this beautiful mansion and this was all I could see to do my sketch. Originally built for another well-known entrepreneur, it was bought by the late banker and philanthropist Tan Chin Tuan and for almost 60 years was used as his private residence. Since 2006, the renovated mansion has been used as a hub for business and social events held by the Tan Chin Tuan Foundation. It also houses a collection of memorabilia chronicling the life of this well known Singapore personality. The building, a fusion of colonial architecture and Straits Chinese influences has been restored and fronts a new 20 storey residential tower which has been interestingly built over and behind it. The new 20 storey tower is occupied by the extended family of Tan Chin Tuan with only a few apartments up for lease. Tan Chin Tuan became Chairman of the Overseas Banking Corporation (OCBC) and it was under his stewardship that the OCBC became one of the world's top banks. He died in 2005 at the age of 97. I gleaned a better understanding of the architectural aspects of this renovation on the World Buildings Directory.